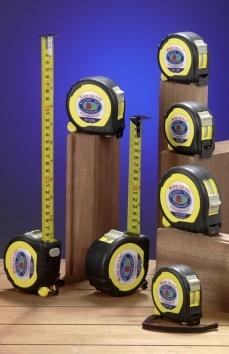 A range of high quality steel tape rules in ABS cases with a moulded rubber grip. These are top quality products and not to be confused with cheap own brand rules from retail outlets. CT50D and CT80D have graduations marked both sides of the blade for those difficult measuring jobs, especially above the head. A double-sided end-piece enables the blade to locate either way up. All blades have dual metric/imperial markings. Dual ABS/rubber robust moulded casing for impact resistance and long life. Tape end-piece secured with four rivets for durability (except CT35). Nylon coated blade for long life and non reflective clear markings. Dual locking system for flexible working. Compliance with European "Class 2" accuracy standard. Heavy duty 25mm blade (on most sizes) for above average pull out in a horizontal plane. CT50D and CT80D have graduations marked both sides of the blade for those difficult measuring jobs, especially above the head. A double-sided end-piece enables the blade to locate either way up.